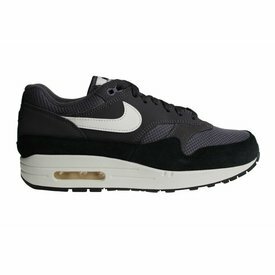 Nike Air Max 1 sneakers for men. These beautiful Nike Air Max 1 sneakers have a all grey upper side and a brown gum sole (bottom of the sole). The front of the upper side of this grey Nike Air Max 1 is made of textile. Nike Air Max 1 Premium SC "Jewel" with a mini Nike swoosh at the sides. Released for men. These crazy vintage models are back in the new old shapes!